[THE FACT] ‘FAN N STAR’, the weekly idol ranking site operated by THE FACT, has announced the billboards screening in Korea and Japan by successfully achieving the birthday support of the singer and actor, Kim Jae Joong. On the 25th, ‘FAN N STAR’ has released the photo of Kim Jae Joong’s birthday video that are screening in Tokyo, Japan. ‘FAN N STAR’ has opened the birthday support event for Kim Jae Joong last December 21, and has achieved 200%. With this, the display at large screen in Tokyo, Japan, and in 43 stations of the subway line 2 in Seoul has been confirmed from 22nd up to 28th. 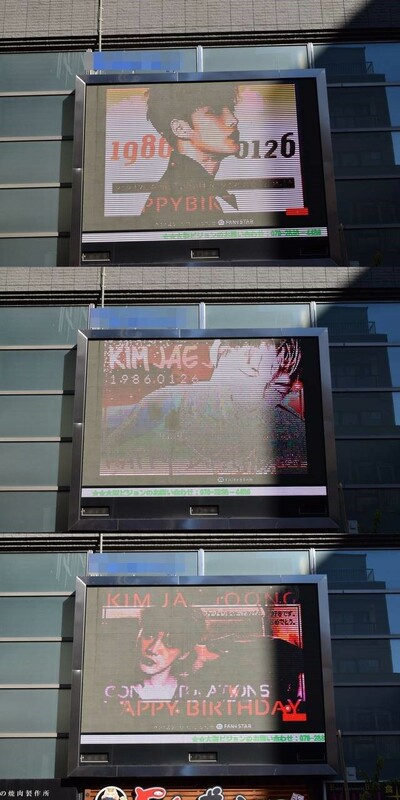 The displayed video shows the fans’ messages and photos who participated in Kim JaeJoong’s birthday support. “I miss Kim JaeJoong. Jae Joong, See you at J-Party.”, said ‘NO.X’. The nickname ‘lilyDefiance126’ said, “Our One & Only! Jaefans love you!”. Meanwhile, ‘FAN N STAR’ is holding ‘THE FACT MUSIC AWARDS’ at Namdong Gymnasium in Namdong-gu, Incheon this coming April 24th.